In conventional Star systems, the substrate lies parallel to a round sputtering target above it. This single sputtering target needs to be significantly larger than the substrate below it to achieve a uniform film thickness. However, in Star systems, it is also possible to rotate the substrate in the chamber and then coat it with inclined targets that are much smaller. These angled sputtering targets are confocal, meaning that they are directed at a common central point below the substrate. Because the substrate is rotating, each individual sputtering target coats the substrate with a uniform thickness. 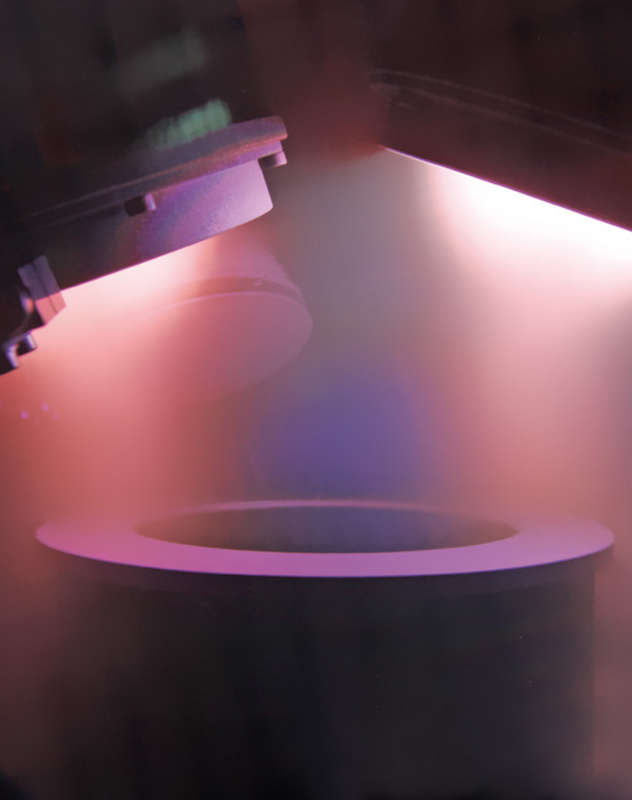 This type of sputtering process is called confocal sputtering. Confocal sputtering is especially suitable for research and development: With up to five sputtering targets in a single process chamber, many combinations of materials can be deposited with no need to break the vacuum. Such a tool also takes up the minimum space in the laboratory. Since co-sputtering of multiple materials at the same time using a confocal arrangement is possible, depositing mixed films from all these materials is also doable. Therefore confocal sputtering enables the deposition of a large variety of materials. Another advantage of confocal sputtering is the smaller target size: The target surface area is smaller by a factor of 4 compared to normal sputtering counterpart, which is particularly attractive when using expensive targets (such as gold and platinum). On the other hand, a conventional arrangement of targets also has its advantages over a confocal arrangement: The deposition rate from a conventional target configuration is about 4 times higher than from a confocal one. The target-to-substrate distance can be chosen freely without needing to consider spatial conflicts between the targets or the corresponding magnetrons. It is possible to achieve a uniform layer thickness even with very thin layers (< 20 nm). In confocal sputtering, the starting angle is of significant importance for the local layer thickness during the first few rotations; in conventional arrangements, the thickness is uniform from the very beginning. Click here for an overview of the Star tools that we have built with targets arranged in both conventional and confocal arrangements. Feel free to contact our system sales department should you have any questions on this topic.